I don’t know how it works, or why. It’s like having a strange and mysterious pet in our closet. We don’t really know what it’s doing, but we just know to keep feeding it. Jesse and I are into breakfast smoothies. It started as a harmless habit and has quickly evolved into an expensive art form. The blame for this mostly lies with kefir, that deliciously tart, liquidy yogurt that gives the smoothie its texture and tang, balancing the sweetness of the fruit and honey. In our house, a smoothie isn’t a smoothie without it. Plain yogurt need not apply. However, at almost $4 a quart, our kefir habit was getting ridiculous. As with most of our nutty DIY projects, the idea started with Jesse, who has been convinced for quite some time that we could just get our own kefir grains and start our own self-sufficient, fermenting smoothie colony. Mmmm. The “grains” aren’t really grains, but rather colonies of bacteria and yeast. They look like little pieces of squishy cauliflower. I didn’t think much of it until I saw him surfing Craigslist one afternoon. “People are just giving this stuff away!” he said. Jesse works in the sharing economy and embraces the idea of sharing, bartering, and working together with unabashed enthusiasm. Seeking balance, I meet those same ideas with unabashed suspicion and paranoia. We make such a nice couple. The next day, as scheduled, our Craigslist connection met Jesse and put a little ziploc baggie of kefir grains in his hand. The guy wasn’t interested in conversation, or gratitude. Jesse said he barely got off his cell phone, or made eye contact. It was like an artisanal drug deal. 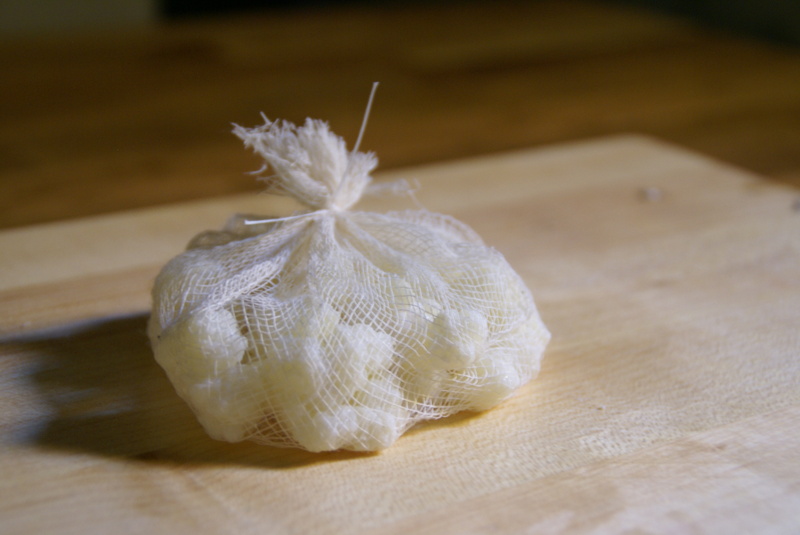 We tie up the kefir grains into a little pouch of cheese cloth tied with dental floss, to make it easier to transfer from one jar to another. I replace the cheese cloth every few days. And now, we are in business! 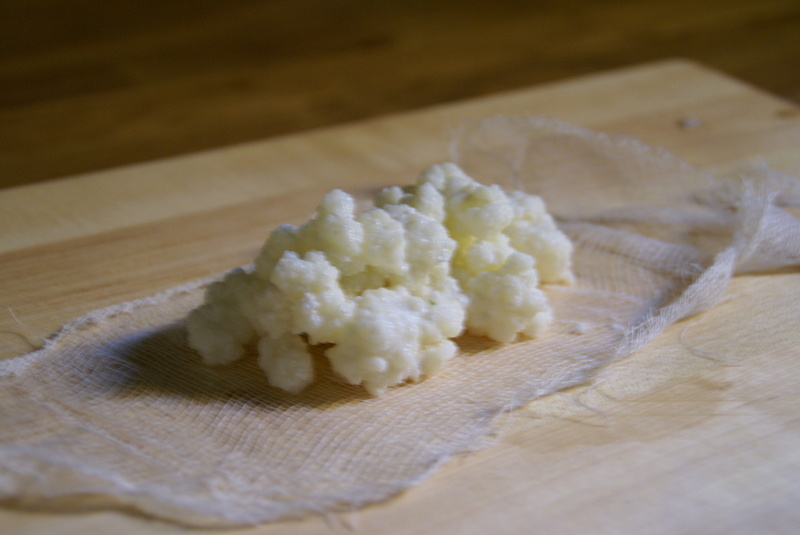 Several days, several instructional web sites, and several botched batches later, we have a consistent supply of kefir coming out of our pantry. Once we got the proportions right it was smooth sailing. 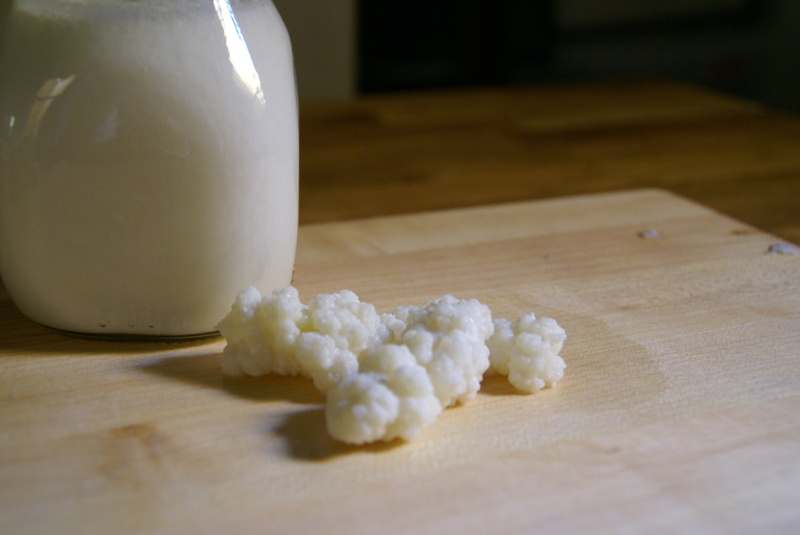 Every day we pour milk over our growing colony of grains, and the next day there’s kefir waiting for us – sour, sweet smelling, and bubbly. 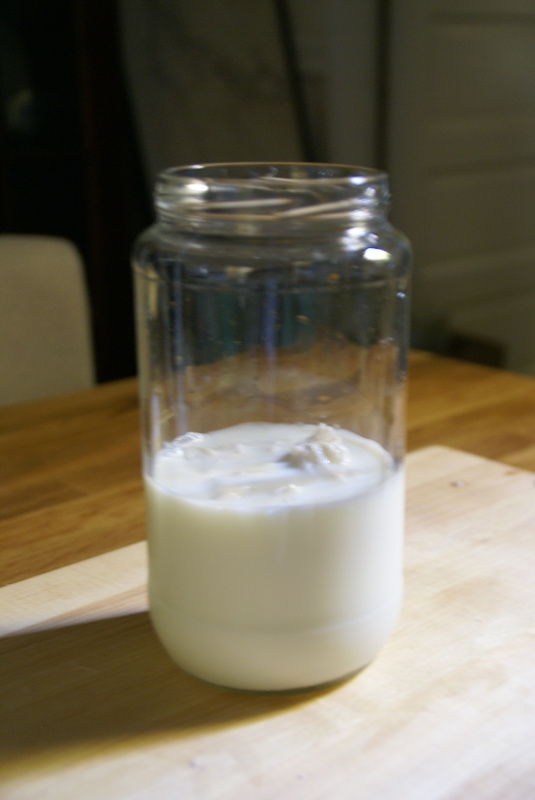 Put the pouch (ours had about 2 T of grains) into a clean glass jar and cover with about 2 cups of milk. Replace the jar lid loosely and put it in a warm place to ferment overnight. After 24-36 hours (depending on your ratio of grains to milk and the temperature of your kitchen), the mixture will start to thicken. If it gets clumpy or starts to separate, you may have let it set too long. This doesn’t actually matter, apparently. If it starts to separate into curds and whey (as it has started to in this photo), just shake it up and pretend it never happened, and adjust timing for next batch. 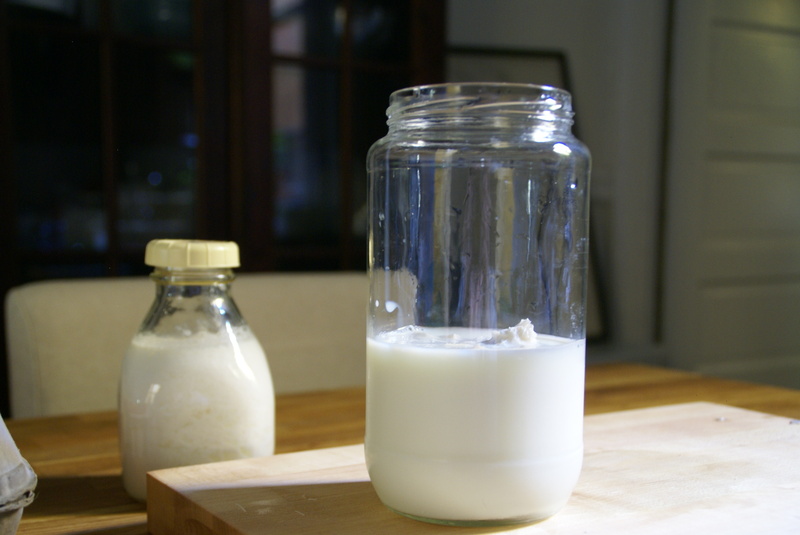 Put your pouch in a fresh jar, cover with fresh milk, and repeat. I kind of agree with you. The first few days I was nervous. But once you see that it actually works, there is something almost subversively satisfying about it. You save a bunch of money. You get to have your own little science project in your cupboard. You get to take some of the mystery, and even fear, out of your food. And after a few weeks, when your kefir colony has multiplied and expanded, you too can be the sketchy person giving away kefir grains for free on Craigslist. 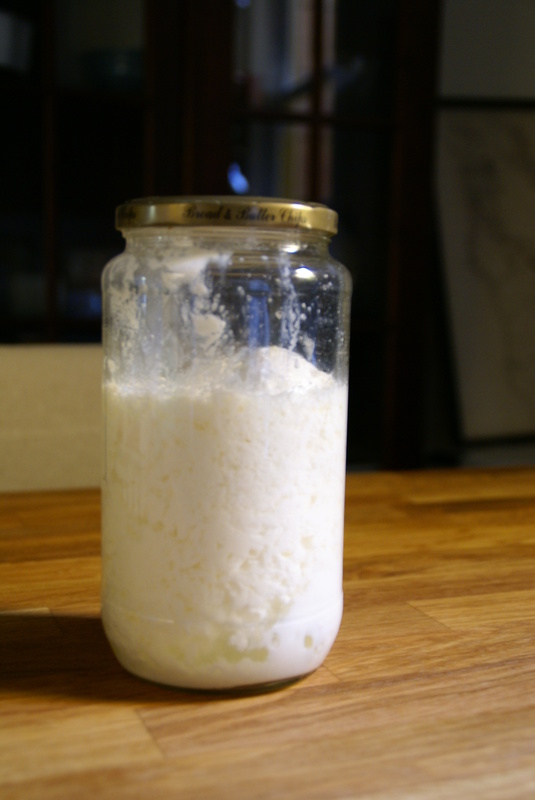 This entry was posted in recipes and tagged DIY, kefir, kitchen experiments by rookerysf. Bookmark the permalink. Hmmnn….yes, these smoothies are delicious. I love that this entry is tagged “kitchen experiments”. I know, you were one of our first victims! I’ve stopped putting the kale in, though. That was just too weird. I live in Memphis, Tn. And I can’t find Kefir grains in any of the health food store which surprises me. Can you offer any suggestions to solve this problem?